23 years, 2 months, 0 day old age. 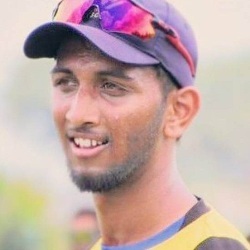 Prasidh Krishna will turn 24 on 19 February, 2020. Only 9 months, 30 days, 3 hours, 53 minutes has left for his next birthday. Prasidh Krishna has celebrated the total number of 23 birthdays till date. See the analysis by days count and bar graph. Prasidh Krishna was born on 19-02-1996 in Bengaluru in the state of Karnataka, India. He is an Indian Cricket Player. Prasidh Krishna hails from Bengaluru in Karnataka. He made his first-class debut against the visiting Bangladesh A team and picked up 5 wicket haul in his debut. 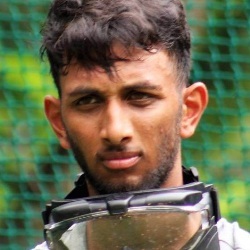 The following year, he made his List A debut for Karnataka and in 2017-18 made his T20 debut after he played for Karnataka in 2017-18 Syed Mushtaq Ali Tournament. He was roped in by KKR as a replacement of their pacer Kamlesh Nagarkoti. He did well and was retained by the franchise for the 2019 edition as well. 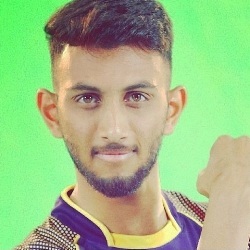 In IPL 2019, he spearhead the bowling attack for KKR and more often than not provided them the early breakthrough. He clocked 140s consistently and troubled the top batsman with his pace and swing. He was coached by Glen Mcgrath at the MRF pace academy and has also received coaching from legendary Australian fast bowler Jeff Thompson at the Cricket Australia's centre of excellence. His career is young but if he continues to bowl the way he has bowled thus far, he might soon find him in the Indian dressing room.